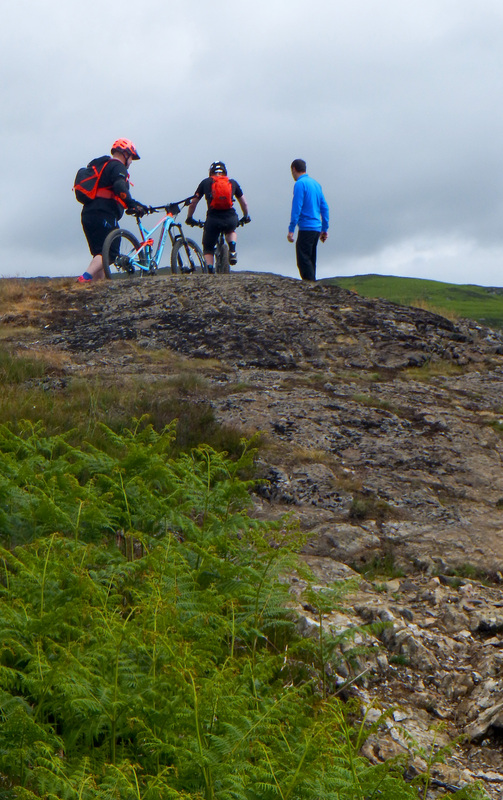 Comrie Croft is a privately owned trail centre and campsite, with a focus on sustainability and serious green credentials, it is also the home of a surprisingly tough enduro. The Cream O’ The Croft is a three day bike festival held over a weekend in June, the highlight being a 9 stage enduro race held on the Saturday. 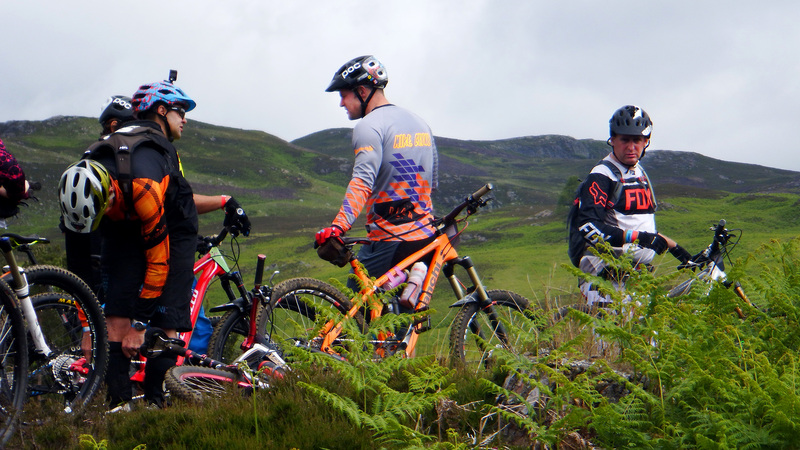 Muckmedden Events was the race organiser, their Fair City Enduro being such a fun event and with Comrie being two hours from me. Well, it would be rude not to race. Arriving on site I was immediately struck by the atmosphere being more like a boutique festival than a mountain bike race. The camp site had as many families and kids running around as hardened racers and privateers. That isn’t to say that there wasn’t a stacked field in attendance, brought home to me as James Shirley’s Radon Factory Racing van parked next to me whilst getting the bike ready. This was going to be a serious day on the bikes. Registration was a quick affair, no queues here, leaving plenty of time to take in the event village. The festival meant there was plenty of attractions for those not racing. Indoor and outdoor bouncy castles, face painting, Segways and a 60 foot slip and slide were just some of the family friendly attractions. This and the food and beer all added up to make the day a great one for little and big ones. I was in the fourteenth wave which gave me plenty of time after the briefing to stretch off and warm up before my start time. The waves left like Swiss trains, and without delay we left the village and started up the climb to stage one. Starting from the highest point on the trails, and with a big audience watching, it was hard not to go full gas straight from the off. Large exposed slabs of rock were punctuated with water bars, loose rocks and punchy climbs. It was a long stage and the pace of the start was hard to maintain, I’m still not pacing properly on stages! I made a few little mistakes and it wasn’t long before “RIDER” was being called from behind. Approaching a group of stationary riders and taping, I could let the acid in my legs ease as it was the end, or so I thought. The stage crossed the start of stage two, I was only half way through! Digging in I passed a few people on hardtails on the descent and made it finally to the end. Making my way up to the start of stage two was a quick affair, were I found that I wasn’t the only one caught out by the physicality of the first stage. The banter was drowned out by people coughing loudly and producing substantial lung biscuits at regular intervals. The second stage was the “XC Stage”, sharing much of the character of the first just with more climbs and prolonged pedaling. This stage had many man made rock gardens of the type that look like stepping stones, the kind specifically designed to rob you of momentum. Keeping light and popping over the water bars the fatigue started to build. I started relying on the bike more and more, and once more, “RIDER”. With a rabbit to chase more depth was found in the legs as I tried to keep him in view till the end of the stage, I failed but I found more speed for the last leg! Stunning views graced every climb. Whilst the day started overcast the clouds soon boiled off and with the mercury rising, keeping fluids up was quickly becoming a priority. This stage was the blue trail, flowing with small drops, berms and moguls to work through. It was a fast and fun stage, bone dry and easy to wash out in the dust if you let your concentration lapse. I had a clean stage except for one thing, the start. I fumble trying to clip in and took what felt like an age to hear that reassuring click and was finally able to get the power down. My goals for the day were to focus on body position and ride clean, aiming to land in the top 50% overall. One thing however was becoming apparent, I need to work on my starts. I was losing to much time trying to dib in and get shifting, I was struggling to clip in and wasn’t getting any power down as I was trying not to slip a pedal. Not good, and definitely room for improvement. This was the climb stage, it was a single track slog that led to a fire road grind. It used the climb that was the spine of the days route and I cursed myself for not paying enough attention to where the stage actually ended. This resulted in me leaving to much in the tank, with the end of the stage coming up sooner than expected. Frustrating as climbing is usually a stronger area of my riding, live and learn. Five and seven shared a starting point, one went left the other right. The site is compact for a trail centre with it making best use of the available hill, but this compact nature meant every stage had a queue. Not necessarily a bad thing as you had plenty time to recover, as long as you kept yourself stretched out. This was easily my best and favorite stage of the day, a sentiment echoed by many of the other riders. Starting in tight trees with narrow rooty and rocky trail with serrated rocky drops and chutes. Before breaking the treeline and opening up onto warp speed trails that scythed through the long grass the before dropping down the hillside to the shared end point with stage seven. I finally got a good start, clipping in and getting good power down from the off. I went smooth but not full gas, as it was all to easy to clip a bar or get taken out by a sniper rock on the narrow rutted trail. Keeping momentum on the short climbs as the light started to grow, the trees thinned out and I let the bike run whilst cranking hard. The acceleration was immense, few trails combine tight technical terrain and high speed hill side, and this one was just immense. Dibbing out, I was breathing hard and knew I’d done well (for me) and left little still on the hill, it was onwards and downwards to stage six. This stage presented a total change of pace and a test of handling skill, a line of table tops joined a pump track. The stage was two laps of the pump track, you could pedal up to the first jump, then it was pump and jump for the two laps of the track. A 15 second time penalty for any pedaling after the first jump kept things interesting. I (like a good number of riders) got a few laps in on the pump track before the race briefing, so I was confident that I would be able to make the two laps without penalty. Sprinting hard out the gate to get as much acceleration whilst I could, I was cleanly over the jumps and into the pump track. It went well but I lost some momentum towards the end of the second lap, still, no time penalties. By now the sky was a deep azure, with the thick heat and sound of crickets chirping their song along every trail, you could swear we were racing on the continent. Back up the climb that was a recurring feature of the day and to decision rock. Whilst waiting my turn in the line, word came up that someone had crashed at the first feature, a rocky chute with drops almost immediately after the start. This prompted half the queue to go for a short track walk to see what the sapling trees were hiding from us. It was a nasty rock garden with the smoothest line ending on a massive awkward stump waiting to grab your front wheel. Forewarned is forearmed, so it was back to the line to await my turn. The stage was similar in character to stage 5, it had a big unrollable drop half way in and some sharper climbs but a similar style and mix of trail. I got a good start again and made a clean job of the first few features, they were similar to my home trails and fun to ride. I made a total mess of the first sharp climb, losing all momentum and in a totally wrong gear it was faster to get off and run. Clipping back in for another rocky chute it had cost me time, placing 17th on stage 5 and 25th on the seventh. Still making mistakes that I don’t have time to claw back time on, it was over the drop across the hillside meadow before crossing a stream and over the line. The final two stages were two laps of a duel slalom course, swapping over so you raced both lanes. Randomly joining up in the queue with a female rider with a rather serious looking Giant I knew she’d be quick. The start was like the run up to the pump track, flowing brakeless jumps, berms and moguls before a series of flat turns on freshly cut grass. I won the first round, it is probably fair to say she won the second but it was close racing both times. James Shirley and Mike Clyne gave a lesson in dibbing out on the final stages and posted wins in their respective categories. The party atmosphere was building in the event village with the beer flowing and the side “races” kicking off, like the kids granny ring drag race or the adults balance bike drag race. The weather had played ball and the organizers, sponsors and local producers had covered themselves in glory, top day. With the racing over it was back to the registration desk to get my times and see where I currently stood. I’d landed at 33rd overall when I checked out, a time I wish I could pretend would stick. In the end I was 71st out of 172 overall. 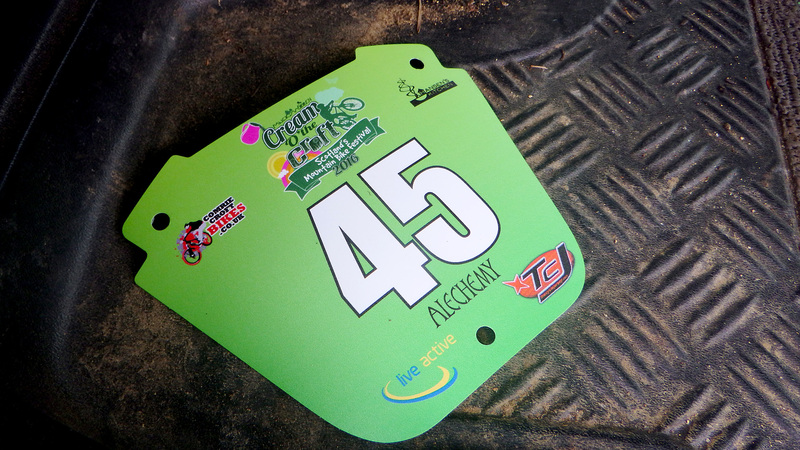 I’d achieved my goal for the day of being in the top 50% overall and had improved on my previous enduro result. My other focus for the day will still need work, but with new things learned at every race there are always things to carry forward to the next one. Next stop, Tour De Ben?